A heavy burden is easier to carry if everyone who shares in the load does their part to help support the weight. It’s the same with salmon conservation. We all value salmon and we all must share the burden to protect and restore this rapidly disappearing resource. We must spread the weight of the burden of conservation across harvest, hatcheries and habitat because these are the factors that most influence the health of the salmon resource. While each is an equally important part of salmon management, harvest has historically shouldered most of the conservation load. Since the mid-1980s, harvest has been reduced by more than 80 percent to protect weak wild salmon stocks. As the resource continues to decline, tribal and state fisheries are more regulated than ever before to sustain the resource, yet every day we are losing the fight for recovery. Salmon populations are declining because their habitat is disappearing faster than it can be restored. Meanwhile, the hatcheries that were built to make up for fish lost because of damaged habitat are under increasingly heavy attack. Opponents want them all closed. They claim hatcheries produce genetically inferior fish that sometimes stray onto spawning grounds and pass along their genes to wild fish. But if wild fish continue to disappear because of lost habitat, and hatcheries can no longer produce salmon for harvest, there won’t be any fishing for anyone. Our treaty-reserved rights include the right to have fish available for harvest. We did not give up nearly all of the land in western Washington so that we can put our nets in the water and pull them up empty time after time. State government budget shortfalls and the effects of climate change are making things worse. Because of the ongoing loss of habitat, we are becoming more and more dependent on hatcheries to provide salmon for harvest. 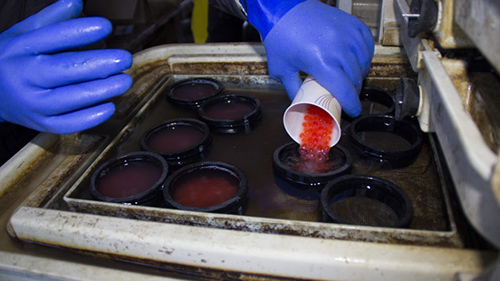 Today more than half of the salmon harvested in western Washington are hatchery fish. Tribes are increasingly concerned about the ongoing reduction in funding for the Washington Department of Fish and Wildlife. In just the past six years alone, the department has cut more than $50 million from its budget, much of it from hatchery production. We don’t yet know how much funding the agency will receive for the next couple of years, but further cuts could lead to closure of some hatcheries and reduced production at others. Tribes already are picking up the check more and more to keep salmon coming back for everyone who lives here. 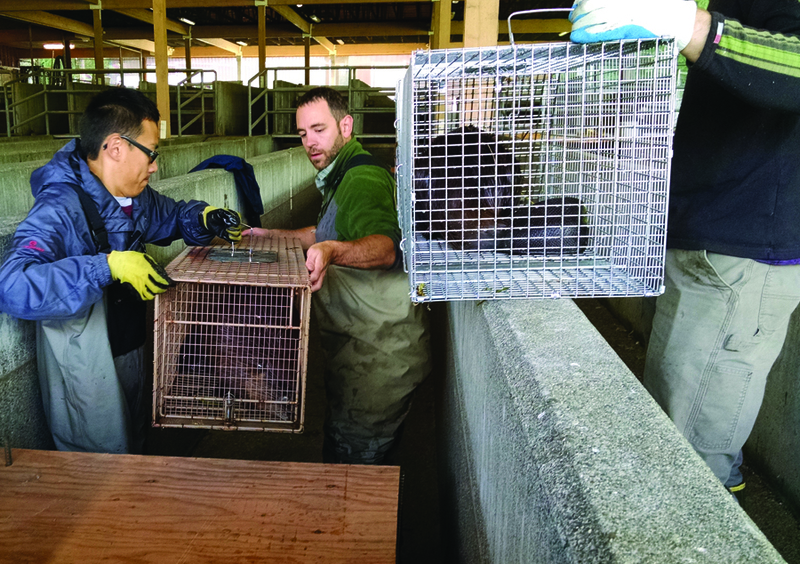 From taking over some state hatchery operations to buying fish food and donating cash and labor, tribes are working to keep up hatchery production. This is in addition to the 40 million salmon and steelhead that tribal hatcheries release annually. Meanwhile, the added effects of climate change are causing more harm to salmon throughout their entire life cycle. A record low snowpack, low stream flows and increasing water temperatures, combined with the results of ongoing habitat loss and declining marine survival, are forcing tribal and state co-managers to implement some of the most restrictive fishing seasons ever seen. Salmon are in a spiral to extinction today, along with our treaty-protected fishing rights. Something has to change. That “something” is the share of the conservation burden carried by habitat. Right now, the treaty tribes are doing most of the work to protect and restore salmon habitat. The tribes and state operate safe, responsible hatchery programs that are guided by the best available science. We will need these hatcheries for as long as habitat continues to limit natural production from our watersheds. If eliminating harvest was the solution to salmon recovery, we would have accomplished it a long time ago. That is because habitat – more than any other factor – determines the health of the salmon resource. We have lost more fish to disappearing habitat than have been or ever will be harvested. If we want more fish, we have to protect the habitat that both hatchery and wild salmon depend on. We may not be able to do much to control climate change, but we can do a lot more to stop the loss and damage of salmon spawning and rearing habitat. Let’s start by enforcing laws already on the books to protect salmon habitat and stop the bleeding in our watersheds. The burden of conservation must be better shared by habitat if we are going to recover salmon. Harvest and hatcheries have been carrying most of the weight for far too long. EVERETT — The Snohomish County Council last week signed off on an agreement that brings it closer to creating salmon habitat on Smith Island. The county plans to create a 350-acre wetland at the mouth of the Snohomish River. The $25 million project involves removing dikes and allowing the acreage to flood, turning it back into a saltwater estuary. The plan has drawn opposition from businesses that share the island. They are concerned about effects on their properties from construction or saltwater flooding. 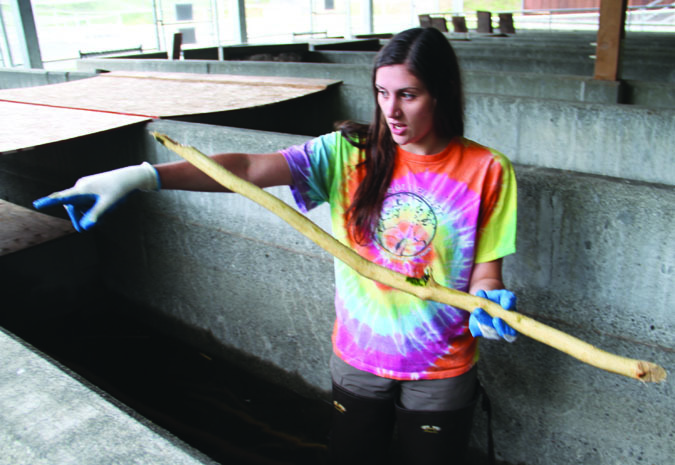 Those concerns range from construction traffic at Dagmar’s Marina, sedimentation affecting Buse Timber’s ability to float logs in the river, and saltwater degrading the soil at Hima Nursery. The three firms, which comprise Diking Improvement District 5, had been negotiating the agreement with the county to clear the way for the project in exchange for assurances that it won’t affect their businesses. The Snohomish County Farm Bureau plans to continue to challenge the project. Wednesday’s decision followed a continuation of public comments from the previous week. Ed Husmann, president of the Farm Bureau, listed a number of concerns his group has had with the project, including that the county hasn’t followed legal processes, that $25 million is an “absurd price” for a project that might return just 800 adult salmon to the area, that the county hasn’t fully investigated the project’s effects on a buried Puget Sound Energy natural gas pipeline, and that no science has been submitted that would show the project would succeed. Brian Dorsey, deputy prosecuting attorney for Snohomish County, said the signed agreement with the diking district doesn’t commit the county to the project or even authorize the project to begin but, rather, lays down the legal framework under which the project would operate. The County Council would have to approve a separate ordinance specifically authorizing the work to begin, Dorsey said. Debbie Terwilleger, the director of the county’s Surface Water Management Program, explained that the project is focused on the creation of habitat for juvenile salmon. The anticipated return of 800 adults to a revitalized estuary could produce up to 250,000 juvenile fish. Steve Dickson, the special projects manager for the county Public Works department, told the council that the county will need to get approval from Puget Sound Energy before the project can commence. That agreement should be worked out in the next couple of weeks, Dickson said. The council voted 3-1 to approve the agreement with the diking district, with Councilman Ken Klein voting against it, citing his opposition to converting agricultural land into an estuary and the need to expand support for local farmers. “Until I see a reversal of those trends, a reversal of the death spiral of the farming industry, I cannot support one acre being taken out of production in Snohomish County,” Klein said. Council Chair Dave Somers agreed in spirit but felt that much of the loss of farmland in the county started with converting farmland to development, especially in the Marysville-Arlington area, and restoring salmon habitat was also a commitment the county had to keep. “We do need to remember that we do have a commitment to everybody, but that doesn’t mean we stop everything in our fish and estuary restoration,” Somers said. 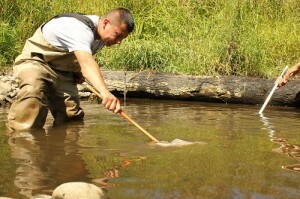 Kyle Kautz, Nisqually tribal natural resources, collects fish from a pool in the former Ohop Creek channel. This summer, the Nisqually Tribe, the Nisqually Land Trust and the South Puget Sound Salmon Enhancement Group are tacking on another 1.5 miles of restored habitat to Ohop Creek. Over a century ago farmers turned the creek into a straight-flowing ditch in an attempt to dry out the valley floor and create cattle pasture. However, deep clay deposits in the soil continued to hold water year round, and despite the failed effort to completely dry the valley the stream remained channelized. “It went from a shallow, meandering stream that was very good for salmon to a straight ditch,” Troutt said. The Ohop Creek restoration will include digging an entirely new channel as well as adding other features, such as logjams and deep pools, that will provide habitat for salmon. Salmon habitat restoration on the creek began in 2009 with a repaired one-mile channel just upstream of the new site. That channel was constructed to restore a sinuous stream that connected to its floodplain. The floodplain, now replanted with native vegetation, re-creates 80 acres of healthy riparian habitat that controls water temperatures and stabilizes the stream banks. The project partners have already documented the progress of the upstream restoration. “We’ve seen a lot of changes, down to the types of birds that visit the site,” Troutt said. Early results include increased use by salmon and the return of wildlife species, such as elk, that had not been seen in the valley for decades. Ohop Creek is one of two major tributaries to the Nisqually River that can support chinook salmon and steelhead, both of which are listed as threatened under the federal Endangered Species Act. “Because there are only a few places other than the mainstem of the Nisqually River where they can spawn, increasing the quality of habitat in those places is important,” Troutt said. 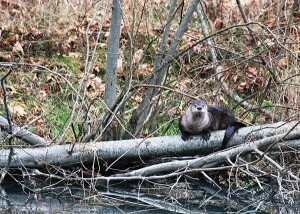 Ohop Creek also supports coho and pink salmon and cutthroat trout. The Lower Elwha Klallam Tribe is wrapping up its four-year study on river otters and American dippers in the Elwha River watershed. 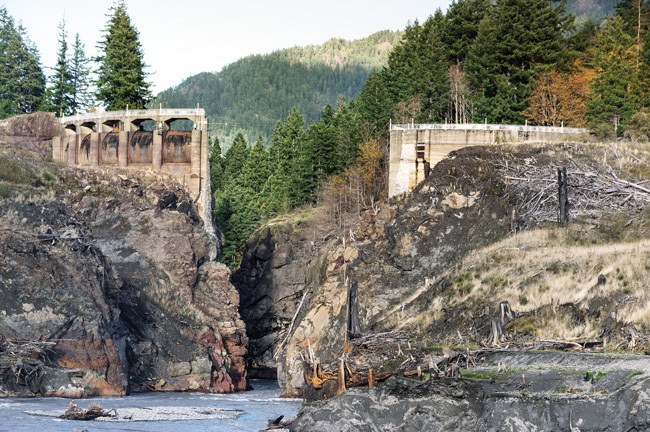 The tribe has been studying how the animals use the river for food and habitat and how those needs have been impacted by the recent removal of the river’s Elwha and Glines Canyon dams. Since the early 20th century, the dams prevented salmon from spawning beyond the first five miles of the river, denying wildlife an important food source. The upper watershed also was deprived of the marine-derived nutrients that salmon carcasses provide to the surrounding ecosystem. As the dams have been removed and salmon have been able to move upriver, the otters and dippers have been taking advantage of the new resources, said Kim Sager-Fradkin, the tribe’s wildlife biologist. 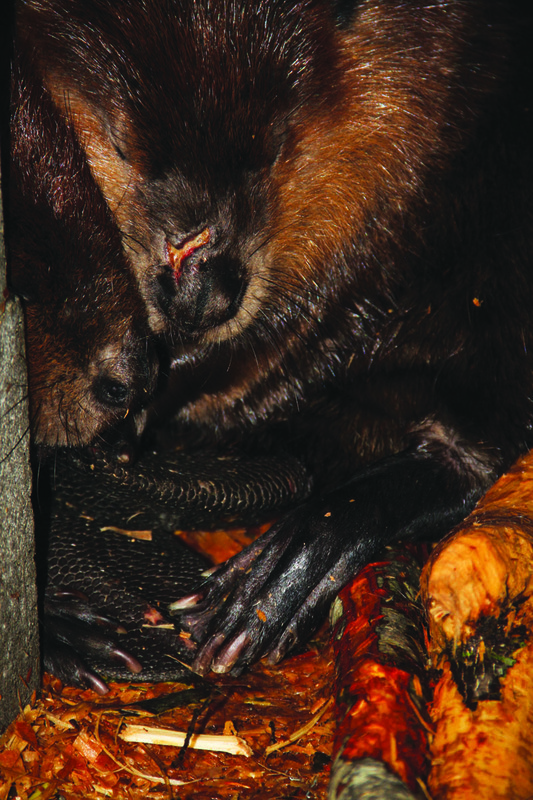 Between 2011 and 2014, blood, feather, toenail and tissue samples were collected for genetic and diet analysis. The tribe also tagged 11 otters with radio tracking devices and tagged 246 dippers with small leg bands to track migration patterns. Dippers also used tributary and side channel habitats during dam removal and increased sediment loads in the river, she added. Analyses of the animals’ diets showed that both otters and dippers are eating more marine-derived nutrients now than before the dams started to come down. “Presumably this is either through direct consumption of salmon or through consumption of aquatic macroinvertebrates that have become enriched with marine-derived nutrients,” she said. In addition, female dippers breeding in areas without salmon had worse body conditions compared to dippers breeding in areas with salmon. Also, adult dippers found in areas with salmon migration had higher survival than those in areas without salmon. The Elwha Dam has been fully removed since 2013 and the Glines Canyon is expected to be fully removed by the end of 2014.